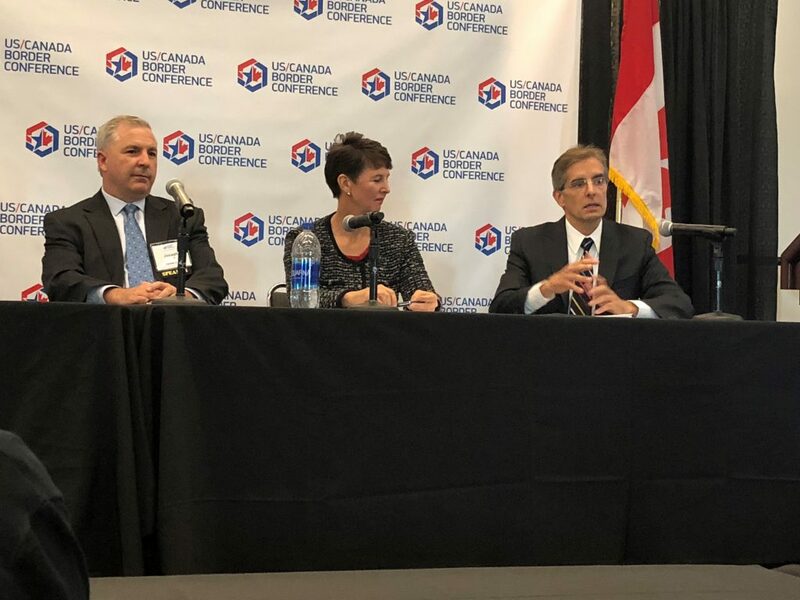 The annual U.S./ Canada Border Conference, held in Detroit on September 20-21, convenes current and former senior officials from U.S. and Canadian border agencies to discuss issues impacting the two countries’ cross-border relationship. The conference was established soon after the 2011 U.S. and Canada joint “Beyond the Border” declaration as a forum to advance the ‘Beyond the Border’ Action Plan. This year’s theme was “New Realities in North America: Crossroads and Partnership”. Perhaps no topic better exemplifies that theme right now than the North American Free Trade Agreement, which was still under tense negotiations as the conference was taking place. Not one to shy away from a tense trade topic, CT Strategies’ Allen Gina moderated the NAFTA Panel, which featured U.S. Customs and Border Protection, Executive Assistant Commissioner of the Office of Trade, Brenda Smith; former Canadian Ambassador to the U.S., Michael Kergin, and President of Farrow, a large customs brokerage, Joseph Trulik. Discussion topics included CBP’s role in and goals for the NAFTA renegotiation process, potential unintended consequences of a ‘new NAFTA’, how a non-trilateral relationship might look if the U.S., Canada, and Mexico do not all reach the same agreement, and balancing trade enforcement and facilitation between the two countries in a politically evolving trade environment. Other panels included “Trends and Threats”, featuring the CBP and CBSA Intelligence Chiefs; “Beyond Preclearance” including private sector officials from Canadian National Railroad, the Peace Bridge, Vancouver Airport, and the Can/Am Border Trade Alliance; Technology, E-Commerce, and the Legalization of Marijuana; all featuring former and current senior leaders from CBP and the Canadian Border Service Agency. CT Strategies looks forward to supporting and participating in the U.S./Canada Border Conference again in 2019 and beyond!